The fine 2003 R. Lopez de Heredia Vina Cubillo Crianza from the Rioja Alta subregion of the Rioja DOC in Spain has a light edge that shows its age with a light ruby brown color and a nose of oak and cherry. With the typical light palate of Rioja wine, the Lopez de Heredia has a nice balance of fruit, oak, and leather with medium tannins and a tinge of acidity. The Lopez de Heredia has a smooth finish reflecting the character of Tempranillo and definitive oak aging. 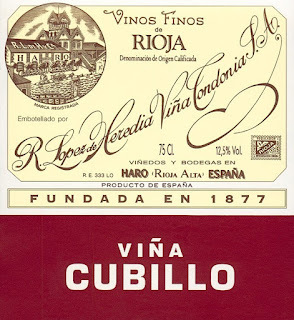 The 2003 R. Lopez de Heredia Vina Cubillo Crianza has 13% alcohol and is comprised of 65% Tempranillo, 25% Granache, 5% Graciano, and 5% Mazuello. It is entirely estate grown and bottled from Haro (Rioja Alta). A nice easy drinking Rioja that will go great with food.